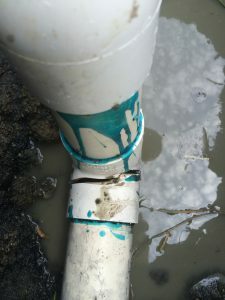 PVC discharge for sewage pump - Callaway Plumbing and Drains Ltd. | Callaway Plumbing and Drains Ltd.
CALLAWAY Plumbing and Drains Ltd. was called to investigate a sewer odor, after walking around the property to find the sewer lateral and finding a sewage pump station on site, we then noticed a wet depression in the ground. 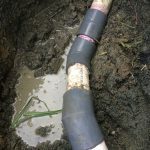 We then excavated the area to find that the discharge line was installed with regular PVC schedule 40 fittings the wrong glue and that a 90 degree elbow had cracked and was pumping the effluent into the soil. 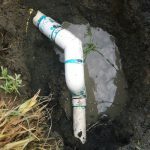 CALLAWAY Plumbing and Drains Ltd. installed new schedule 80 PVC fittings to replace the cracked fitting and then recharged the sewage pump discharge line. 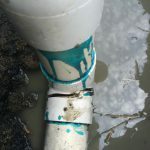 This is code that on ALL PVC pump discharges that the PVC pipe be primed, grey glue and that schedule 80 fittings are used for all elbows and that the pipe is painted with purple paint to mark as non potable.